Keene's deluxe 4" dredge has all the features of the larger professional dredges. This is the most popular 4" dredge in the world! 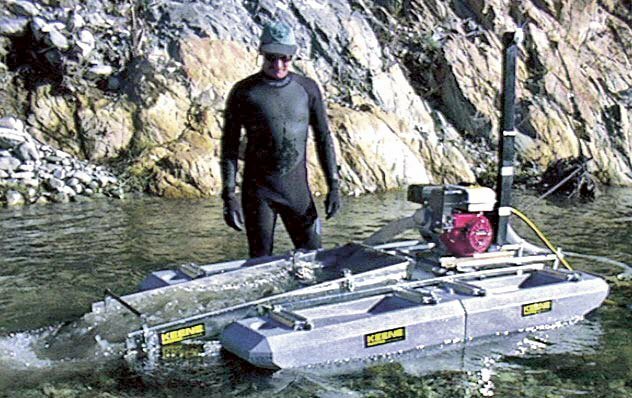 The 4" dredge is ideal for the prospector requiring a light portable dredge with capacity to move large amounts of material. Experience the professional 3-stage recovery features of Keene's larger dredges. 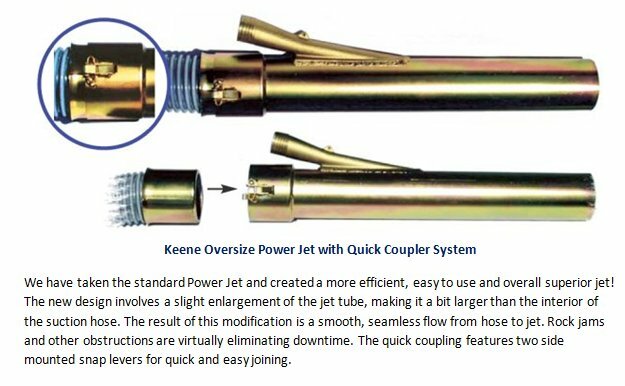 Experience fine gold recovery, in a lighter and more compact dredge that will out-perform any double or triple sluice on the market. This unit includes an air compressor for working underwater if desired (optional dive gear required). The 4" Deluxe also features a four piece modular marlex frame and float assembly for better stability in fast and deep water. The floats have recessed tool and hardware holders molded in their tops. And although when assembled you have more floatation than the 4" Ultra because it breaks down into four separate floats instead of two each float alone is easier to handle. However, as good as the frame and floats are it is the 3-stage recovery system that steals the show on the 4" Deluxe gold dredge.